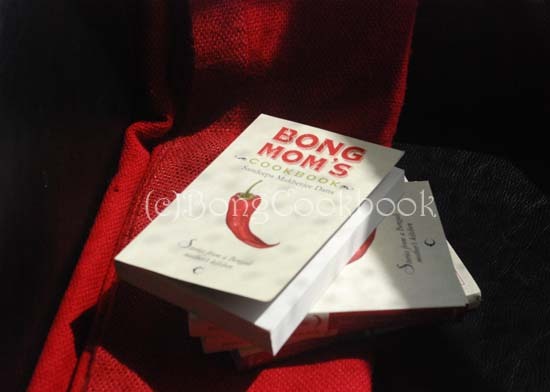 While I was writing my book, there was a section on the superlative vegetarian cooking of the Bengali ladies of my grandmother's generation, especially the vegetarian cooking of Bengali widows in those times. Due to practical reasons, that you only encounter when you are writing a book, I finally left out a portion of that section which recounted tales about my grandmother's sister. 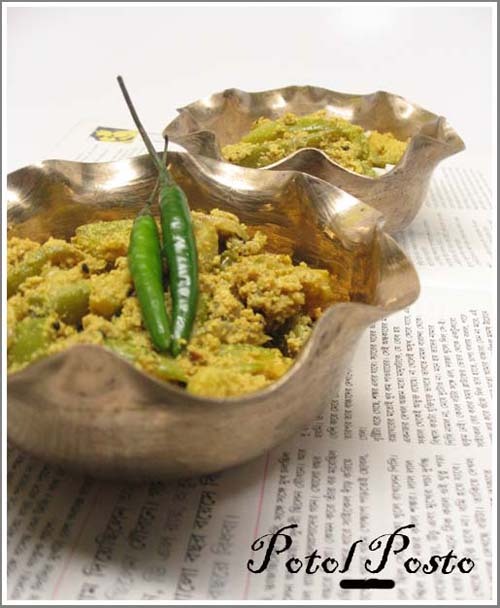 But I always have my blog to tell those stories, and this recipe of Chingri diye Aloo Phulkopir Dalna though my Mother's and not entirely vegetarian, is the fitting place to write it. And yes, the book has many more stories to keep you entertained. So please check this book page for reviews, book related giveaway etc.and order your own copy. Most of you have heard about the strict taboos placed on the eating habits of Bengali Hindu Widows until the mid 20th century. They were prohibited from eating non-vegetarian food like fish, meat, eggs, certain lentils like masoor and vegetables like onion and garlic. 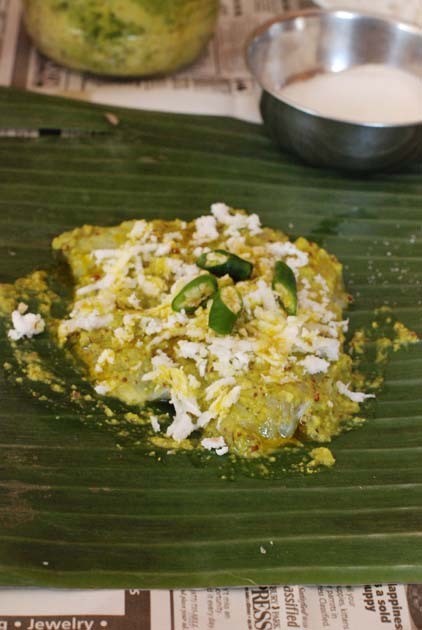 These were regarded as tamasik food, food that could induce passion and thus were a strict non-no for Bengali widows.The rules of course were set by a patriarchal society where men who had lost their wives were free to gallivant around with kept women, eat anything they wanted and drink to drown their sorrow. The females alas had no such choices. By the time it was the 1970's, society had opened up but the rules laid down long back still ran deep. A fall out of these strict rules was the excellent culinary skills achieved by most Bengali widows of that time, in their vegetarian cooking.Within their limitation, they created magic. Amongst the family and relatives I knew, no one really enforced such strict rules, at least not openly but some of the women themselves embraced the taboos of their own volition. One of them was my father's grandmother. We called her "Baro Ma". I had known her for only that one year, that our life intersected and to me she was the stern lady in the sepia toned framed picture that hung above the dresser in my grandparent's room. To my father and uncle however she was the doting grandmother, one whom they loved more than their own mother. She was also the greatest cook and till this date my father tries to conjure up the taste of her paayesh and mohonbhog in his own memory. "Baro Ma" had lost her husband when she was in her mid or late sixties. She was a woman of strong determination and steely grit and if I believe stories told by my Baba, there was no society who could force her to do anything. It is only natural that in the stories retold by my father, I see "Baro Ma", not as a deprived woman, but one of immense self-control who ate only one full meal a day and that too a meal that was strictly vegetarian. It could have been that it was easier for her to give up the non-vegetarian food she was used to eating because she was already at an age when lust and passion for food was not foremost on her mind. Now, though she ate only once a day, her meals were very elaborate. That she loved to cook and was an expert at it, only helped. Baba says, her meals would always follow six courses starting with bitter neem leaves when they were in season or some fritters/bora made with the bitter leaves of polta pata or some dish made with uchhe. This would always be followed by some shaak or greens. Palong, Paat, Note, Pui, the variety was endless. Protein would come in the form of dals. 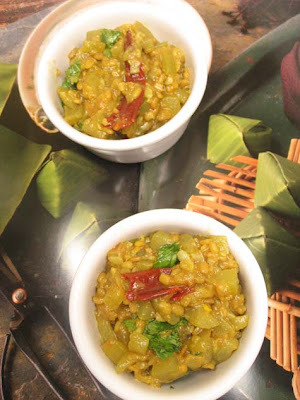 Lentils would not only be simmered into Dals but also ground and spiced to make different boras which were fried and added to many dish. 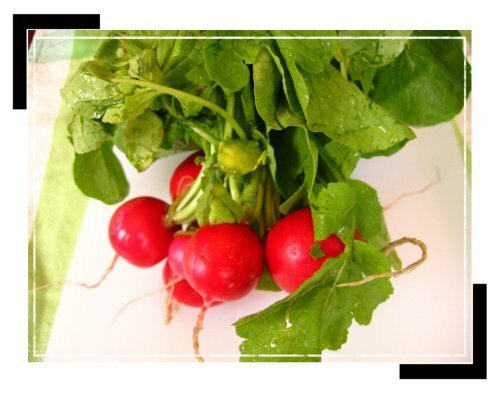 This would be followed with other vegetable preparations depending on season. The meal would always end with a milk based dessert, usually a bowl of milk which had simmered for long on the low flames of the coal unoon and had a thick layer of fat or shor on its surface. Vegetarianism only made her hone her culinary skills and with the aid of fresh vegetables, dollops of ghee, variety of spices and creamy whole milk from their own cows, she conjured meals so good that my father and uncle preferred sharing her meal than their own fish or meat options. While I have only heard about her meals, the next story is about my father's aunt who lost her husband, when I was around 9-10 years old. N Dida, was also in her sixties, a cheerful soul who lived by herself in a house with a sprawling verandah, not very far from our own home. After the passing away of her husband, she too was sucked into folds of vegetarianism with a strong force. Again, no one had asked her to do so, she lived by herself and there was no one to judge what she did in the confines of her own home either.I was a budding feminist and I thought it was extremely unfair that N Dida had to give up fish and meat. When she came to visit us, I would insist that she eat the Britannia cake that everyone knew had eggs in it. She never agreed.Now, that I think of it, while no one asked her to give up meat and fish, none of the elders insisted that she eat them either. The times that we visited her though, the food was so good that I never missed our non-veg options. Soft pillow like chanar dalna soaked in a sweetish gravy, dhoka--the squares of spiced lentils in a reddish looking curry, aloo posto, daal er bora, it was an endless feast. She loved my Mother's cooking and Ma always took great pains to serve elaborate vegetarian meals when N dida came to visit. 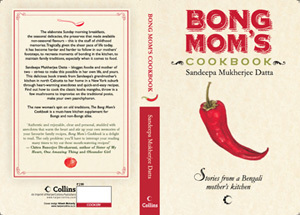 Though many Bengalis think that a meal without fish or meat is hardly a meal to live life by and many non-Bengalis cannot imagine a Bengali eating anything other than sweet and fish, the truth is there exists a whole array of rich and flavorful Bengali vegetarian dishes and many of them owe their existence to these enterprising women of the early 20th century who were forced to give up their largely fish diet. Also there are many Bengali vegetarian dishes that can transcend the fine line from veg to non-veg simply by adding a few shrimp or prawns. It was this trick that the Bengali jester "Gopal BhaNr" applied to extort money from his widowed Pishi. There is a very old story about how the aunt being a widow was not allowed to touch non-veg and had cooked a niramish lau ghonto for Gopal. Gopal did a mean trick of adding some fried shrimp to the dish while eating and declaring that it was the best "Lau-Chingri" -- bottlegourd with shrimp he had eaten. The aunt afraid at what the society would say if they heard of this had agreed to give Gopal money to keep his mouth shut. Now that I try to retell the story, which celebrated Gopa BhaNr's cunning and which we lapped up as kids, I realize how mean it was. Goes to show how conditioned we are to set rules. 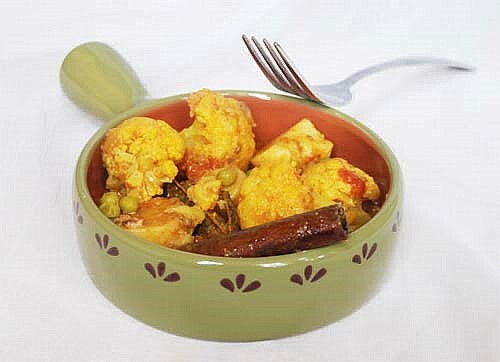 Today's Alu Phulkopir Dalna -- potato and cauliflower curry, is a similar dish where addition of some succulent prawns transfers it from a vegetarian delight to a non-vegetarian dream of Chingri Aloo Phulkopi'r Dalna. You take your pick. 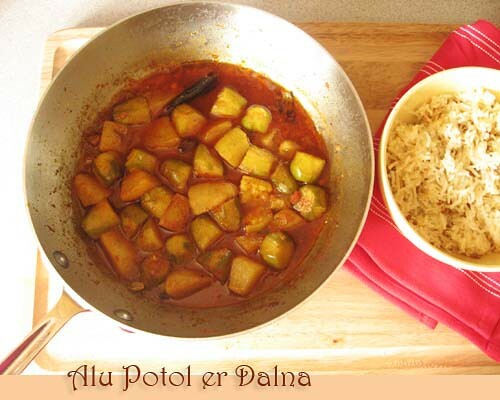 The nuances of the dalna is explained in the Alu Potol er Dalna here. I make this potato cauliflower dish along similar lines. Some families add onion to this dish but my Mother, a sparse user of onion did not and I too abide by that. If you are going to add prawns there are two options. If using the headless ones, cleaning is easy. Remove the shell, keeping tail intact. Devein shrimp. Rinse. For the head-on shrimp carefully remove the whiskers and sharp points on the head along with the eyes. Do not remove the entire head though because it adds to the taste of the gravy. Carefully devein and remove the shell from the body keeping the tail intact. Rinse thoroughly. Now toss the cleaned prawns with turmeric powder and salt. Chop 1 medium sized cauliflower in medium sized florets. Soak in warm water with salt for 10 minutes. 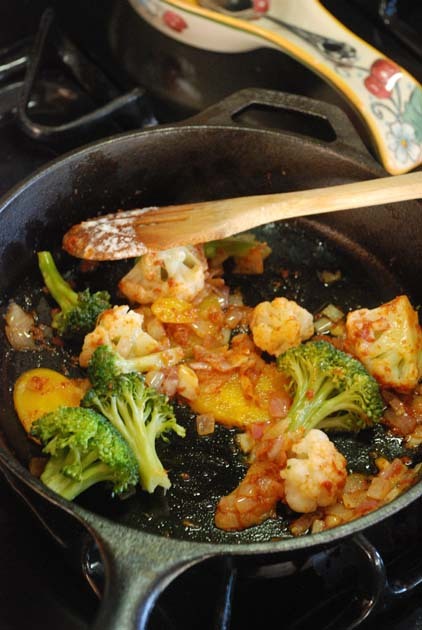 Heat Oil in a wok and fry the cauliflower florets with 1/4 tsp of turmeric till they are golden with brown spots. Remove with a slotted spoon and drain on a paper towel. Heat some more Oil in the same wok. When the spices sizzle add 2-3 peeled whole tomatoes from a can or 1 big juicy tomato pureed or finely chopped. Fry the tomato for couple of minutes till the raw smell is gone. If you are not the smelling type, check to see if the oil is separating from the masala.If you don't like bits and pieces of tomato in the gravy, I suggest puree and then add it. Add 2 medium sized potato, peeled and quartered. Add 1/4 tsp of Turmeric and saute the potatoes till they take on a gold hue. Next throw in 1/3 cup of fresh or frozen peas. Keep sauteing/frying for the next 3-4 minutes. 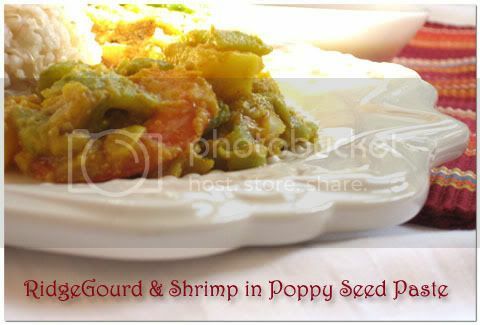 When using shrimp no need to add peas. Note: I roast coriander/cumin seeds and grind them to a fine powder. I also use Deggi Mirch so use Red Chili Powder according to taste. Adjust for seasoning and add about 1/2 tsp of sugar. 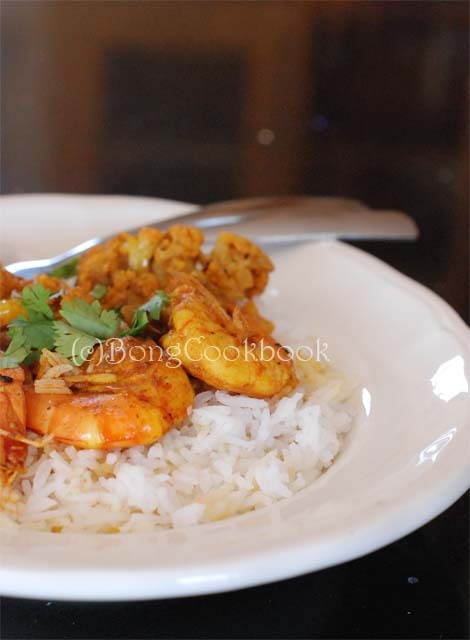 If you are using prawns, add the fried prawns to the gravy at this point and simmer for 3-4minutes at medium heat. 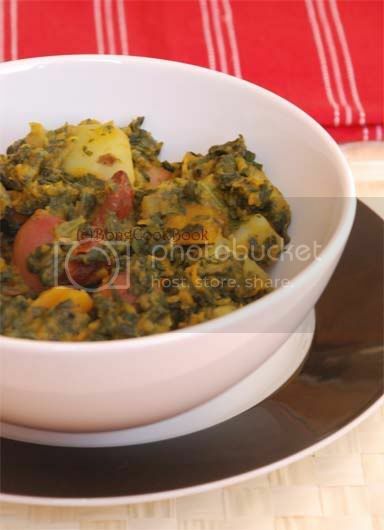 Stir Fried Kale with lots of garlic, dry red chillies and then eaten with steaming rice with dollops of Kasundi. Yes ! That easy. 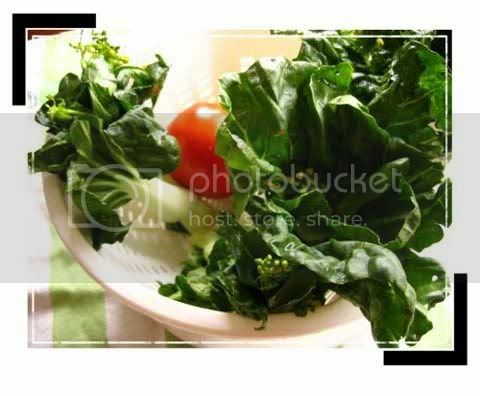 Though I am not too fond of eating "greens", I love green. 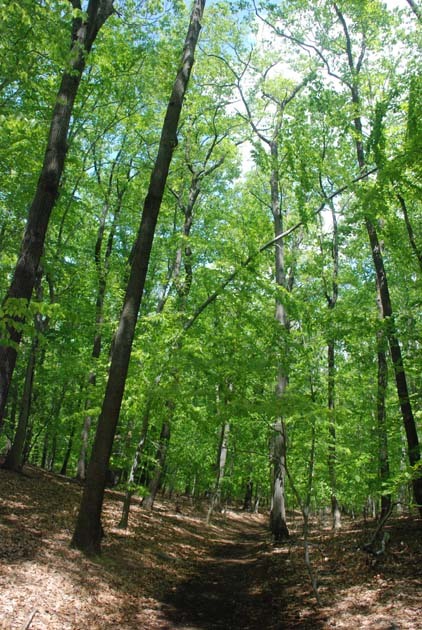 The color green in nature.And as I say every year, I am mesmerized by the green that springs up around where I live as soon as April rolls in. The transformation is so magical and so abundant that coming from a childhood dominated with dusty greens year around, this green grabs me by the throat, flairs my sinuses, makes me take zyrtec and yet mesmerizes me. 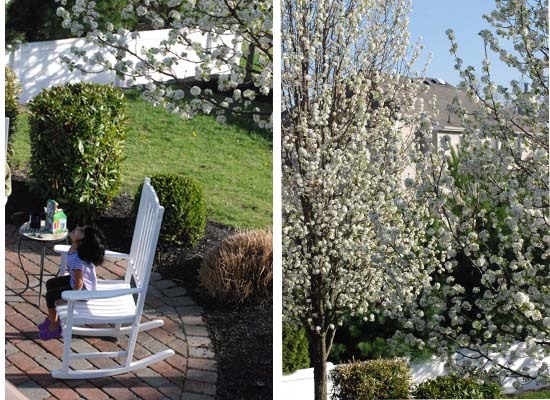 Most evenings these days, I look forward to sitting in the patio and drinking my tea. Just staring at the green trees as I drive to work every day makes me hopeful. 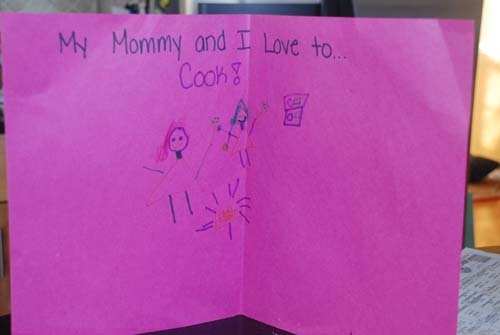 And taking advantage of the green and warm weather, this Mother's Day was spent at the park hiking or rather strolling along one of the trails, enjoying a a picnic lunch of pasta salad and boiled eggs and being treated to umpteen homemade cards. 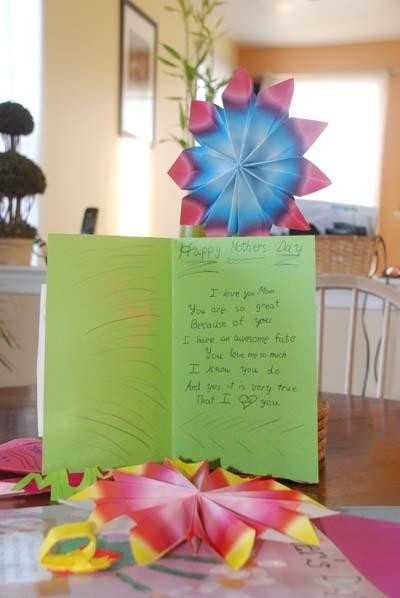 Here is BS's card made during recess at school. My heart swore at the praise bestowed on me until she said,"Fate was the only word that "rhymed" with great.Ar kichu mone aschilo na." I thought, "At least not 'crate' or 'vertebrate' ." But she also took great pain and time to make the beautiful origami flowers following instructions from youtube and that was her gift. Precious. On Friday, I went to LS's school for the Mother's Day tea as is the norm. Either I have just got too used to it or my expectations have gone higher but this year I found the affair to be a bit shoddy. The school could have done a better job, at least as good as last year's. Or the year before that. So anyway during the activity time, there was this rectangular construction paper where the kids had mentioned what they like to do best with their Moms and the Mom-child duo were supposed to draw/paint on that theme. No surprise, well a little surprise, that LS said she likes cooking with me. Not baking, which she does a fair bit, but cooking. That the kitchen and the adjoining family room is where we all congregate and spend most of our time might make her feel that all she is doing in her free time is cooking with Mom. Also that a couple of times, I have let her get on the step stool and stir something in the pot. And she thwacks garlic and garam masala on the mortar. And she rolls tiny rotis when my Mom is here. And she gets to press the buttons on the blender jar when I am making onion paste. You know where this is going ? In sharp contrast to my childhood where Ma firmly believed "girls need not learn to cook", my kids spend their life in the drudgery of the kitchen. Sniff.Sniff. "So LS, how did you spend your childhood ? What did you play ?" "Ohh, I cooked a lot with my Mom. And then some more." Back to the art project, so LS drew this. She drew me and herself. This time "no visible belly button" and we are making orange Maggi. She also did not let me draw anything other than that single squiggly line of Maggi in the whole page. It is beautiful and is going in my treasure chest. Now, back to the green that I am not terribly fond of. The edible kind. Since my Baba, is not very fond of eating and believes that "bhaat-aluseddho-dim seddho" for lunch and "dudh-pauruti" for dinner is enough for a human being's survival on this planet and everything else is a waste of time, my Ma did not get to cook a wide variety of greens. Palong Shaak, Laal Shaak, Methi shaak were the most common variety in our home. Pui etc. making occasional rounds. I am not sure what she felt at this green limitation but she seemed happy with the choice. It was my husband who however is the green connoisseur having had all kinds from paat to kolmi to pui shaak to lau shaak all through his childhood. But we don't get all that variety here. 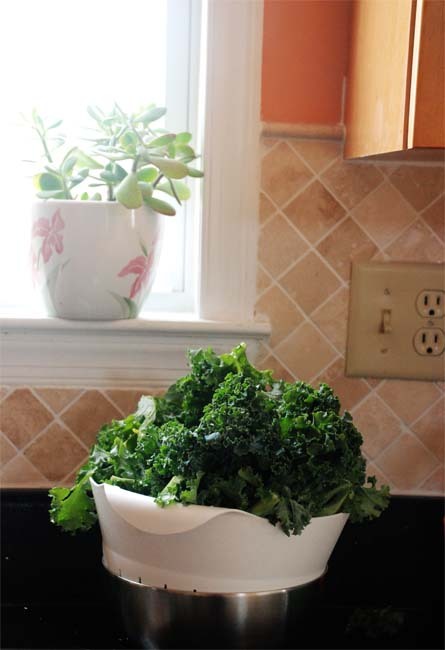 Instead we have the Farmer's market with "Bok Choy", "Kale", "Broccoli raabe", "Collard greens" and "Swiss chard"
Since Kale is being touted as the "queen of greens" and people are drinking Kale Juice by the gallon, I have started buying more of this particular green these days. Temper hot oil with dry red chilli and lots of garlic, thinly sliced. As soon as you get the flavor of garlic, add the greens and mix. If you have a lot of greens instead adding all together , do it in steps. Toss greens, let it wilt a wee bit, add more greens, toss, repeat. Once you have added all the greens and mixed nicely, add salt to taste and cover the saucier. Let the greens cook. Check in between and sprinkle little water if necessary. Meanwhile make a paste of poppy seeds. This is optional but adds a nice touch. 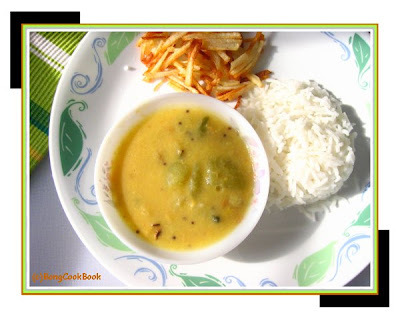 Enjoy with a dollop of Kasundi and steaming hot rice. 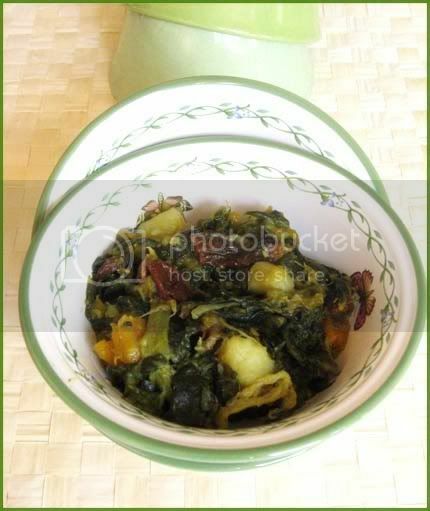 I have also cooked Collard Greens like a Kashmiri Haak. 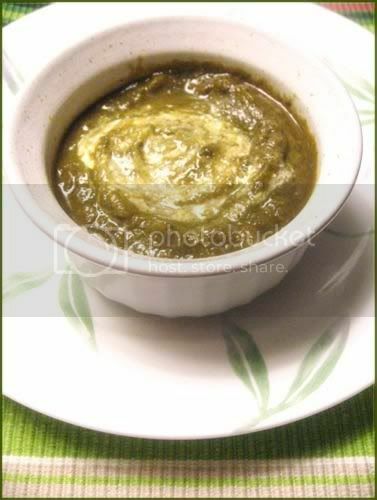 Some of the other green dishes from my blog are here for you to pick and choose. 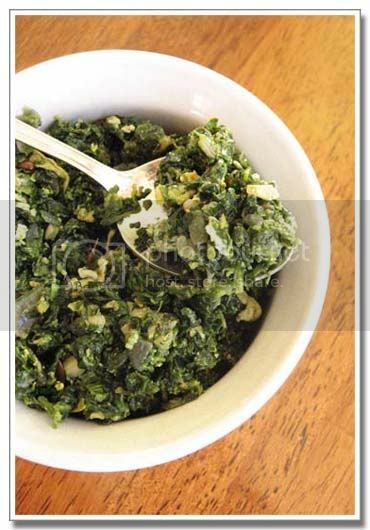 Kale, I cook mostly stir fried like spinach or add to my Dals. Mandira's Kale Chips are very famous too. Thai food is equivalent to comfort food for me. So is it for BS. When we need to be comforted, a plate of white rice and Thai red curry comes very very close to masoor dal and alu posto. I might as well have been a Thai Mom. Next life, I will try to go about it. So when another Bong Friend. N, who am sure has already applied for the Thai Mom position even before me, for she loves Thai Food above and beyond everything else, suggested this pasta cooked in red curry paste and coconut milk, I just blindly followed. And then I threw in stuff I had in my refrigerator. It was the easiest and most delicious meal to rustle up if you have Thai red curry and Coconut milk in your pantry. This time I dried up the sauce a bit but on afterthought next time I will have a little more gravy. First boil pasta according to package directions. I used Fusili, my friends used elbow but I think spaghetti would go best. Anything else should be fine though. When the oil is hot add two fat clove of garlic finely minced. Follow with quarter of an onion minced or chopped small. Saute till onion is soft and translucent. Add couple of thai basil leaves at this point. Now add about 1-2 tbsp of red curry paste. I use the Maesri brand. The amount will depend on your spice level, I went a bit low because the kids would have it. Add little salt and sugar to taste and mix well. Add the pre-cooked veggies, some halved cherry tomatoes and let the sauce simmer to a boil. 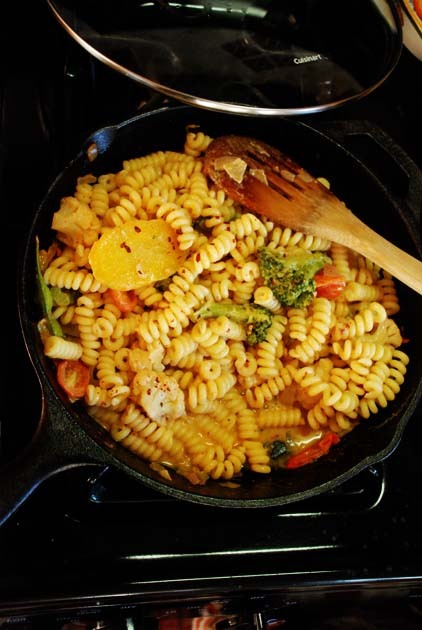 When the sauce is right consistency for you, add the cooked pasta and toss in the sauce. Cook for a couple more minutes and switch off. Garnish with Basil leaves. "Ma, Maa", Mr. Bhattacharya's stentorian voice resonated across the still sleepy neighborhood. The two gray pigeons trying to catch the last snatches of sleep in their filigreed skylight home, flapped their wings in annoyance and flew up to the terrace. Mangala, the neighborhood milkman's much pampered cow, shook herself and hurriedly called out with a matching "Moooo", as she shuffled to get on her four legs. The far eastern horizon beyond the neem tree, behind the mismatched houses of the neighborhood, further from the swanky new flat building, now had strokes of pink on a slate background and the last of the twinkling stars knew it was time to wrap up their nightly glamour and take rest. "Your neighbor Bhattacharjee kaku is very religious. Too much I would say," the Sens' youngest son's brand new wife, who had married into the salmon pink two storeyed house across the Bhattacharya's colonial gray one, jangled her shiny gold bangles in irritation. Unaware of what his neighbors thought, Mr.Bhattacharya, CIO of McNally and Sand, freshly bathed and pious at 4:30 in the morning, picked Ma's favorite flowers, the scarlet hibiscus from his sprawling garden. He had four varieties of hibiscus. The crimson, pale pink, the soft egg yolk yellow and of course the scarlet, rokto joba, the Mother's favorite. Gently he plucked the flowers from their stem, the petals wet with morning dew, and put them in his saaji as he sang a Kaali Bhajan in a low voice that lacked sweetness or tune. What he lacked in tune, he made up in his earnestness though. After he had offered his prayers in the marble floored prayer room and lighted enough incense to fill the whole house with fragrance, he went to meet his Mother. On dot at 6:10. This was his everyday routine. One and half hour spent for Ma Kaali and then 20 minutes for his own mother Suhasini. In this twenty minutes he made sure that Suhasini was taking her medicine and doing the exercises suggested by the therapist. If time permitted, they also discussed the state of the country and listened to Suhasini reminisce about her childhood in Jamalpur. For Suhasini, these were precious 20 minutes. She had led a hard life with a husband whose temper was legendary and a mother-in-law known for her miserliness. It was only in her old age, as a widow, that she finally could experience a comfortable life. And for that she was grateful to her son. She had been an ordinary Mother, with little time for her son in a life filled with drudgery and hardship. But the boy had worked hard and made a name for himself. In his busy life, he had not forgotten his Mother and pampered her with all the affulencies that she never could have imagined for herself. Yes, she knew, he had a temper, as bad as his father if not worse. At times she even felt a pang for Sunita, her daughter-in-law. But she kept quiet. Everyone on this earth is born with their fate written on their forehead. Who was she to interfere and upset that ? When the clock on the dining room wall struck 7:30, Mr.Bhattacharya came down to breakfast. He did the same every morning. In fact he was so punctual that you could adjust your clock by him. "What is this ?" he shouted. His face puffed up, his jaws stern. The early morning piousness had been wiped off by an almost cruel expression. Suhasini, counted her rudraksha beads faster. The Sen's youngest son's new wife, in the salmon pink house across, nodded her head in disdain and said "There, he goes again like clockwork". "Why did you make Luchi for breakfast ?How many times have I told you that on first Thursdays of every month, I will have only crisp buttered toast and sausage for breakfast ? Did your Masters in International Affairs not teach you even this ?" Mr. Bhattacharya thundered. With a powerful swipe of his right wrist, he sent the platter of white puffed luchis hurtling across the rosewood dining table. The airy luchis, floated in the air for a millisecond before they plopped on the shiny expensive moasic. 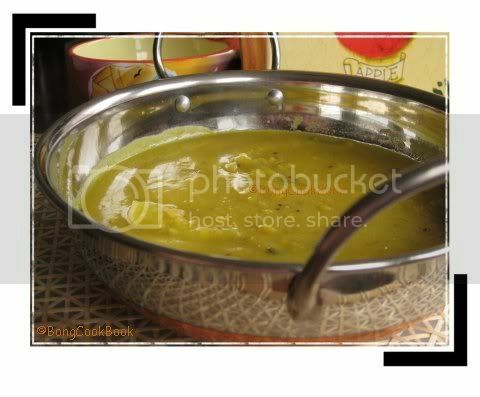 The bowl of sada alu charchari lazily hit the wall and landed with a thud, the steel bowl making a clattering sound. In the kitchen, Sunita, his wife of 20 years stopped midway in her effort to make the next luchi puff up right. Mr.Bhattacharya uttered profanities and called names. She kept quiet. She had learned the power of silence in her 20 years of marriage. It was not that he was a bad man and she had learned to shake off words like water from a duck's back. "You cannot handle even simple affairs at home, how do you work at that bank of yours ? Some sorry state it must be in. Don't know what you would have done if you worked in a corporate office like mine ? They would have fired you the very next day. And remember, if I see such carelessness again, I will make sure that you are kicked out of this house," he wagged his finger and announced before stomping off to his chauffered car that waited at the front gate. Sunita still silent, switched off the stove and went on her task of picking up the deflated luchis from the floor. "Bouma, how many times have I told you that my son has a bit of a temper. If you would only be a little more careful when he is around, " Suhasini said in a liquid whisper, her 63 year old voice tinged with guilt. "Had she been a good Mother?" the doubt rose like bile in her throat. "At least I am better off than Malati," thought Sunita. Malati, their house help, had called in sick again today. Her husband had beaten her black and blue last night. "At least I don't get beaten up like her," she comforted herself. "Don't understand why she just doesn't walk out. She is educated, earns a good living and still...," the Sen's youngest son's new wife gossiped to her colleague over the water cooler. There is a little backdrop to this story. It was triggered by this ad, from a series called "Ma jaisa Koi Nahi" by Mother Dairy and which I got as a forward either on last year's Mother's Day or later. BTW, there are other Mother Dairy ads in the same series which are perfectly fine but it was this that I had got and this that I will talk about today. That an ad from a reputed company would think it was completely natural for the husband to behave in such crass manner and then promote it on national television, amazed me. Don't know what they were trying to prove but then such scenarios do happen in many homes. It is easy to say that an educated women could walk out of the situation or try to make it better. But I have been privy to a couple of such women and however educated and strong they are, when looked at from their viewpoint it is easier said than done. In a world that celebrates Motherhood but has little respect for its women -- Happy Mother's Day. While it is only mildly warm in my part of the world, I know it is raging summer in most parts of India. 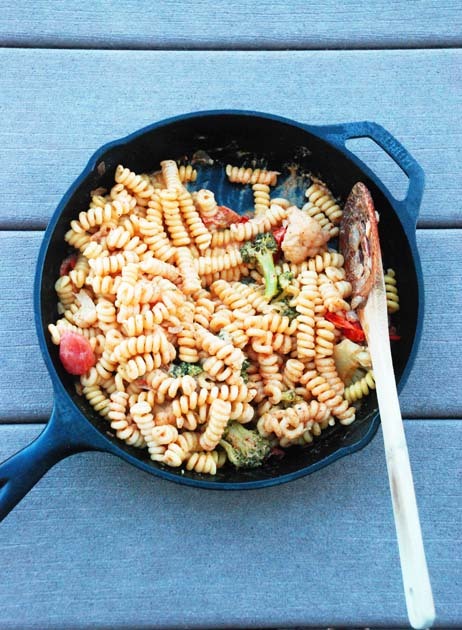 So I thought of sharing a few dishes perfect for summer from my blog with you. May has been a happening month so far. Both in good ways and bad. But we won't discuss the bad. I am trying to be in peace with the fact that --"If things are not in my control, I better not break my head trying to control them". Is that a saying or did I just make it up ? If I made it up, that will be my first quote. Get used to my wisdom people. So what if I don't live by them. 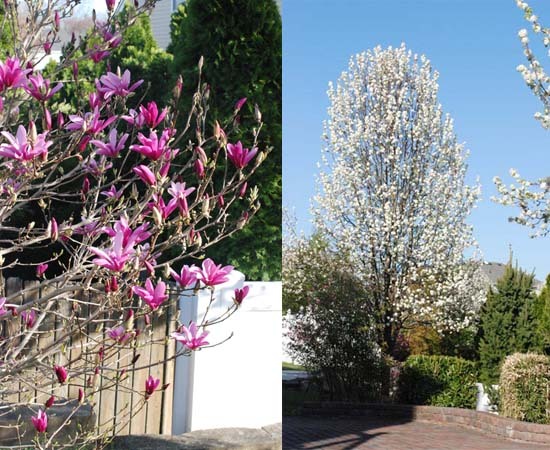 So, first May and even April was good because we could finally tide over winter, watch buds bloom, hear birds chirp and not wear heavy jackets to dinner. One who has never worn a fur lined double layered jacket and been strapped inside an overheated car day in day out, will never know what bliss it is to not wear them. I would say the month was good because of just that one single reason. Period. But then something more exciting happened. I went to Chitra Banerjee Divakaruni's reading of her newest novel, "The Oleander Girl" in the city. I am not much of a city goer but sitting on a public transit bus which was crawling at a pace less than a snail and watching the skyline outside change from a backdrop of slate grey pink to pitch dark, I had a liberating experience. Yes, I was getting painfully late but it was okay. I was going for myself alone. I had no one to answer to and no phone calls if I did not make it on time.It is rarely that I ever go anywhere for myself and very rarely is it done without a certain goal in mind. Just to risk a work day evening to travel 120 minutes for the sole purpose of listening to a favorite author ? I have never ventured that far before. And meeting the author was worth the experience.Strangely I have never wanted to meet authors before. I love or not-love them through their books.It is their written words that conjure a image in my mind and I don't think meeting Agatha Christie or P.G.Wodehouse or Bani Basu or even Chitra Banerjee in person would alter anything. 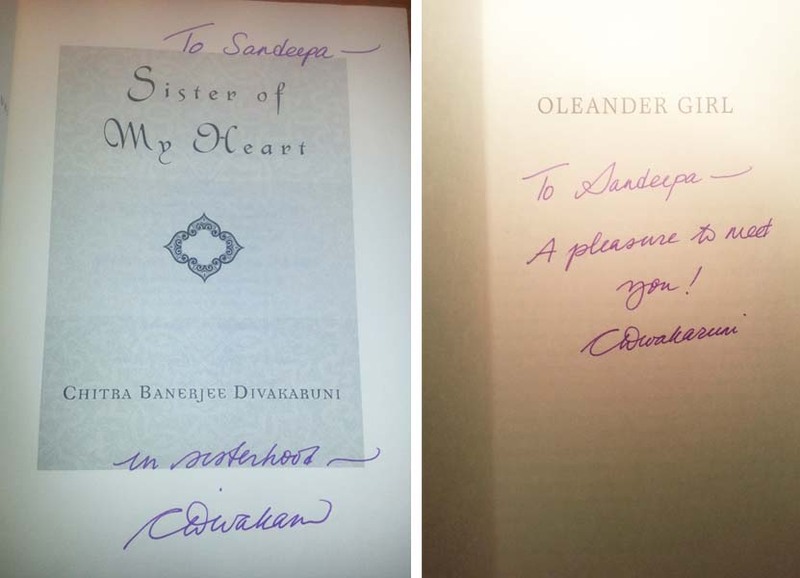 But this time I wanted to go and I am so glad I did.I felt so enriched just by hearing her answer questions about how she writes, how she thinks in different voices and gets into the skin of the characters, about how she draws characters from mythology and her gem of an advice to new authors. "Read," she said. "Read, not merely as a reader but as a writer". OMG, and did I just say Voice ? Voice ? Two years ago the only voice I knew was that coming out from my own larynx and here I am throwing about ideas on "voice". Then of course there is my book, of which I received my first few author copies. The afternoon I saw the familiar Harper Collins logo on a hefty cardboard box just outside the door, I panicked and went inside the house without even trying to drag in the box. Should I just ignore it and pretend that this whole thing never happened ? Should I just think of it as a dream and forget it ? Should I just say "Whose darn package is this" and post it back at the return address ? Only after 15 minutes of sweaty palms and racing heart, did I muster enough courage to tell the husband that there was a package at the porch and it might be my book. And even then I could not dare to look at the book, to leaf through its pages, to make sure that it indeed was the one I had written. Of course after the package was opened and the books glanced through, the grim reviewers in my home shared prophecies. "There are only two color pictures. Spot Books have so many nice pictures. This is boring," said the 4 year old LS. The 9 yr old, voracious reader, wanted to read it but I said "Later". After a quick glance through the pages she gravely asked "But will people in US understand it?" I remembered Chitra Banerjee's advice -- never underestimate your readers. The husband-man(referred to in the book as H-man) said, "Your publishers are astute to have done the book in paperback". After a scathing pause he tried to explain, "That way if something goes wrong and the need arises to hit the cook on the head out of frustration, no one will be hurt much. A Hard cover could have been far damaging". I won't say anymore right now. Writing the book was really fun and I am really happy the way it has turned out but this now is the scary part. The book is up on Flipkart for pre-order at a special price. So now it is your turn. Go ahead and order. The word "paaturi" comes from the Bangla word "paata" or leaf . That said, it becomes crystal clear that "Maacher Paturi" or Fish Paturi is a preparation where the fish is cooked in some sort of a leaf. It being a Bengali recipe. 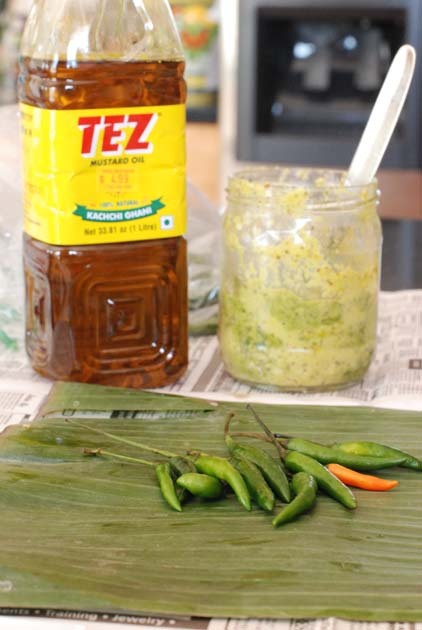 it also becomes more than crystal clear that the said fish has been marinated in a sharp, pungent mustard-y paste of shorshe bata and drizzled with mustard oil. Okay, apparently there is a non-Ghoti version where the fish is wrapped in other spice pastes, not necessarily mustard but I have not tried that. Once these two bases have been covered you are free to "go as you like" on Maachher paturi. 1. 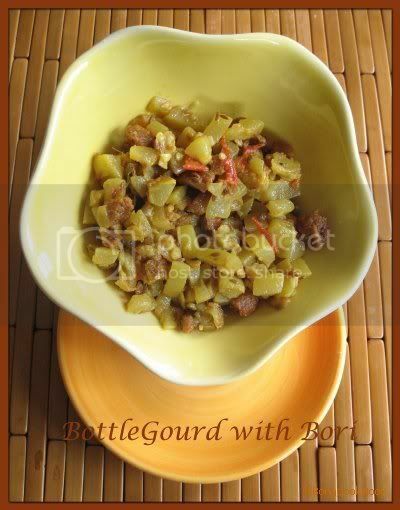 The maacher paturi that I would eat would always be prepared by my Dida. 2. The fish would always be Ilish. 3. The leaf would always be Banana. 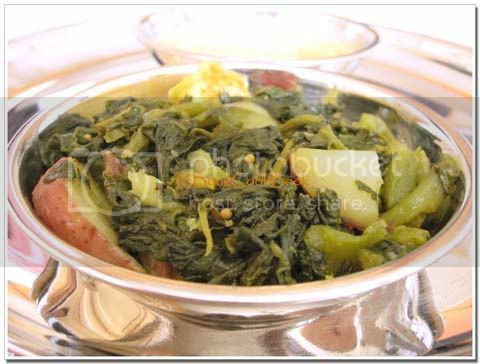 Some homes do their paturi in gourd leaves like Lau Pata and they taste very good too. 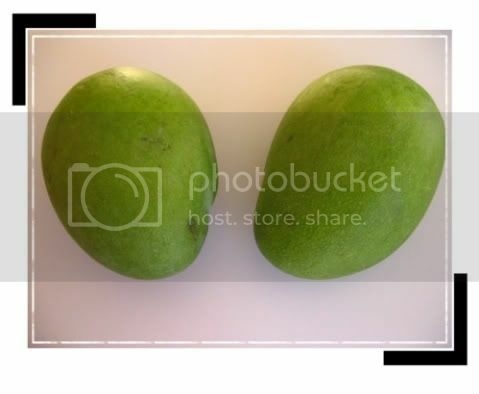 Kolapata was easily available, an arm's length away, growing in perfect neglect amongst the jackfruit and pampered mangoes, making it the leaf of choice. 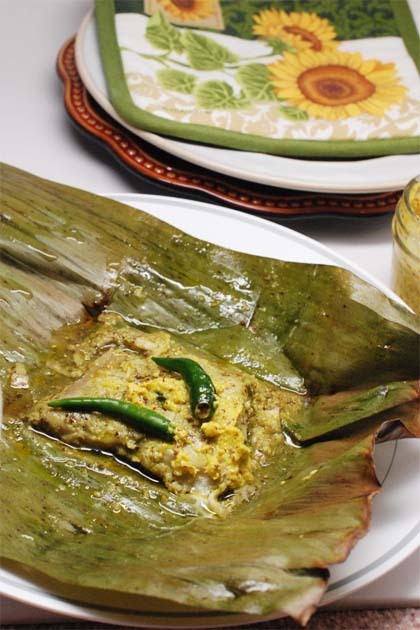 Dida would dab the fresh Ilish pieces with shorshe bata and kaancha shorsher tel, throw in a few green chillies and wrap them up in cut rectangular pieces of the Banana leaf. With an expert hand she then neatly tied the fish parcels with twine, an act which I looked at with much wonder. Not being a very dexterous kind myself, I found the whole "tying with twine" part a very complex act and based on that memory of neat parcels alone, I labeled paturi as a dish difficult to concoct. Once the parcels were ready, Dida would tuck them into the steaming rice, that was cooking in a large pot on the coal stove. 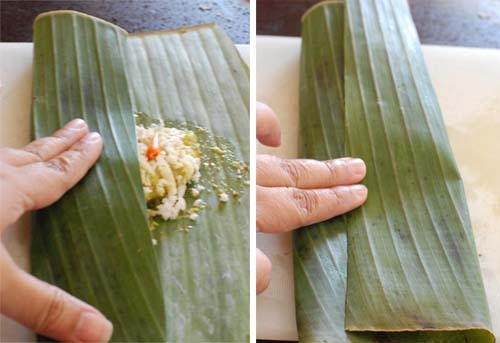 This tucking would happen towards the very end of the rice cooking and the latent heat from the hot rice would steam the fish in their banana leaf parcels. When those leafy envelopes were opened to reveal the mustardy fish, the fragrance was ethereal. 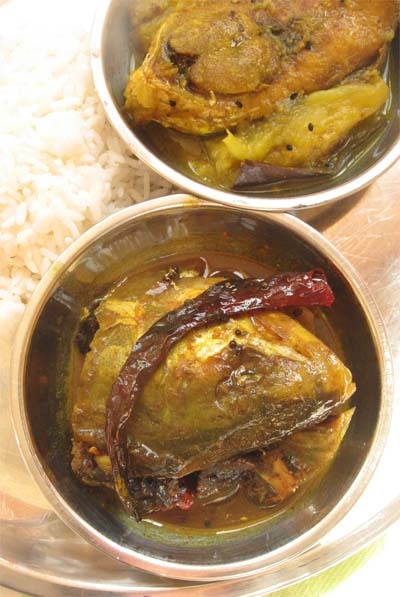 Have you ever taken a strong whiff of banana leaf that has been warmed with steaming rice and then spiked with aroma of shorsher tel and Ilish ? It is hard to describe. Just like it is hard to explain the fragrance of tea in earthen kulhars or the perfume of yellow stalked sheuli that has touched the wet earth on autumn mornings. Some days Dida would also tuck those leafy fish parcels in the dying embers of the unoon or coal stove. The fish cooked slowly, soaking up the flickering heat and smoke, while Dida cleaned up the kitchen, took a shower and offered white balls of nokuldana to her Gopal. That Paaturi tasted a little different from the one cooked in steaming rice. Here the kolapata was lightly charred and had a smoky fragrance where in the other the flavor was more clean and dominated with the fragrance of rice. 20 plus years later, the paturi that I make has the new woman's twist on it. The fragrance is not exactly as it would be in Dida's kitchen. 1. The Banana leaf is bought frozen, in exchange of several dollars from an Asian Store. 2. 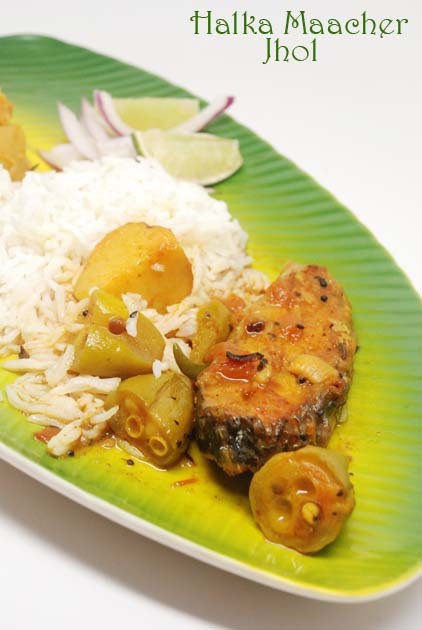 The fish is not always Ilish and fillet of fish like Swai, Salmon and Tilapia are abundantly used. 3. Instead of tucking the fish parcels in a pot of steaming rice or in dying embers, I just put them in the oven. 4. And oh, I never use twine to tie them up. I use toothpicks to secure the packets and heave a sigh of relief. But the taste is pretty close. 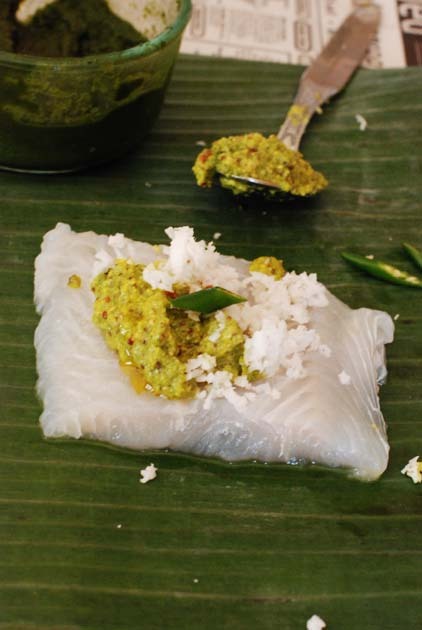 The fish cooked in the banana leaf, is delicate and flavorful, the mustard paste is just as sharp and pungent, the fragrance of the banana leaf as ethereal. You can also steam them in a steamer like this or do them over a covered griddle on the stove. But I almost always do it in the oven, because that way I can forget about them while they cook on timer and go about my life of getting homework done, folding the laundry and prepping for next day's lunch. When it is dinner time, "ting-ting" there is delicious paturi to be had. Amazingly I had blogged about a Thai Fish wrapped in Banana leaves a couple of months ago and given a choice between the Bengali fish paturi and Thai fish in banana leaf, it is hard for us to choose. We love both equally. Clean the fish and get it ready. If you are using fish fillet cut each fillet in about 3"x 3" pieceI started with 2 fillet of swai, each cut in 3. 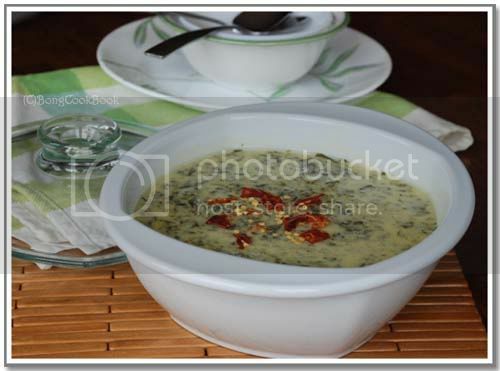 Make homemade Kashundi. The best option and that Kashundi will serve many purpose. Drain and put in a blender jar along with 4-5 hot green chillies. With a splash of water make a thick paste. Mix and make a smooth paste. Variations: Sometimes with mild fish that does not have much flavor of its own like Swai etc., I add some more things to the mustard paste. Like I add couple of tablespoons of dhonepata chaatni(coriander chutney) to the mustard paste and then use it as the marinade. Try it. 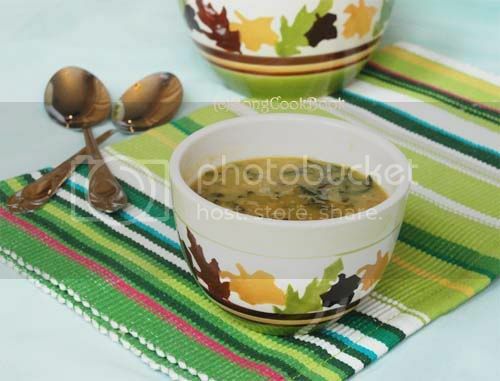 Mustard with fresh coriander adds a beautiful layer of flavor. If you have bought frozen banana leaves, defrost them first by keeping them out at room temperature. Then cut them in rectangles of 6" x 6" or your preferred size. Wash each piece. Dry. Keep aside. Now I buy frozen banana leaves which are already wilted and perfect for wrapping.But if you have fresh banana leaves, you need to prep them for wrapping. First cut off the central thick rib and trim the edges. Then cut them in preferred size. To make them flexible you need to wilt them. For that pop them in the oven at 200F for 5-8 minutes or warm them over very low flame of your stove/gas range. Be careful that you do not char or burn them in the process. 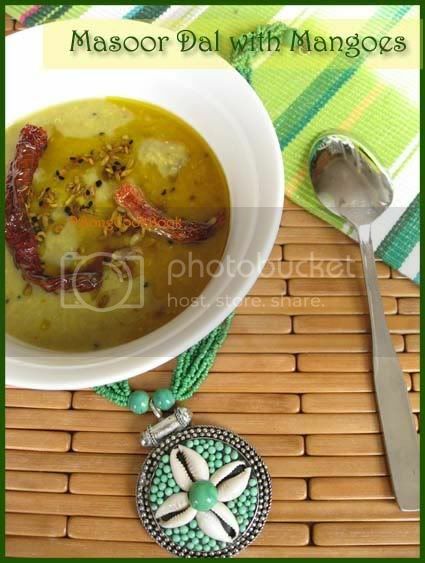 To marinade the fish, you can either use your home-made Kashundi or Mustard paste. Put the fish fillet on the banana leaf. Rub with sprinkle of salt (mustard paste already has salt so very little on fish) and smear generously with the mustard paste. Add few drops of mustard oil. Garnish with a tbsp of grated coconut and slit and chopped green chilli. If using frozen grated coconut , defrost it before using. 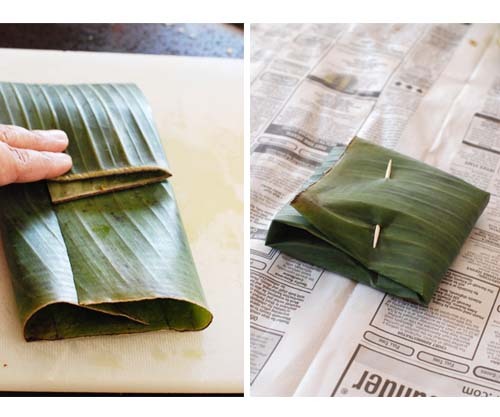 Wrap the banana leaf to make a parcel as shown. Secure the loose ends with a toothpick. Now usually I let these parcels rest for about 30 minutes before popping them in the oven. For a big party, I make the parcels a day ahead and refrigerate(NOT freezer). And then just an hour before the meal, I take them out and let them sit at the counter. I put them in the oven 25-30 minutes before the meal is to be served. That way you get fresh steaming paaturi with minimal effort on party day. Put the packets on a oven proof tray. Pre-heat oven to 350F. Bake these fish parcels for 20-25 minutes until you see the banana leaf charring slightly around the edges. I serve the parcels individually along with steaming white rice.